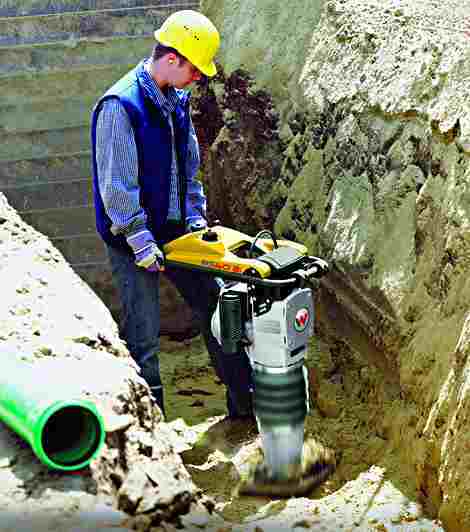 An engine driven plate compactor for use in the compaction of back fill in trenches and other narrow excavations. 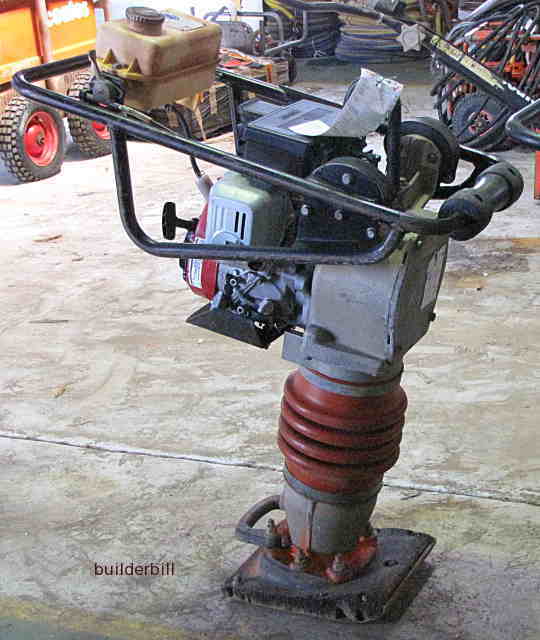 A petrol engine powered plate compactor. These tools are fairly easy to use and in small restricted areas they do a mighty job. Normal safety procedures should be carried out with regard to protective clothing but in particular safety steel toe cap boots should be worn. Never refuel any engine that is hot. Wait for them to cool down. Never start any plate compactor on concrete, in particular this type can really jump high and get out of control. Always have it on earth or sand or gravel to start it. Start on idle and holding the thing firmly gradually increase the revs. It should start bouncing up and down say about 75mm to 150mm, 3" to 6"
If it starts taking bigger jumps shut down the throttle straight away. With a nice rhythm going the packer will want to slowly move forward when held vertical and by tilting the machine the speed and direction of travel can be altered. As with all compaction machines the material being compacted must have the right moisture content. If it is too dry the the packer will just create dust but do no real work. If the fill material is too wet then the compactor will get bogged. As a rough guide, grab a hand full of the back fill material and squeeze it. When you open your hand it should all hold together and clearly show the imprints of your palm and fingers. Ideally the back fill should be placed and compacted in no more that 150mm 6" layers.